Twenty years ago, two OARS guides headed to Australia to explore The Land Down Under. After twelve months and thirteen thousand miles in a 1979 Valiant (without air conditioning) circumnavigating a country about the same size as the Lower 48, they found plenty of adventures and fell in love with The Lucky Country. One particular piece of paradise that has kept them returning year after year is the south east corner and rugged High Country of the Victorian Alps. On this ‘Off the Beaten Track’ tour we’ve chosen to share our little secret with you. We’ll get up close and personal with the wildlife; kangaroos, wallabies, koalas, wombats and the myriad of incredible birds. We’ll explore the engaging history of the hard-working, hard-living early pioneers and meet the local people and learn how they’ve adapted their lives in one of the most remote environments in Australia. We’ll visit numerous National Parks, share meals with local folk and stay in a variety of lodging including off-grid cabins. We’ll also camp three nights on the Snowy River as we leisurely raft through the Snowy River National Park with just the right spice of whitewater in the Tulloch Ard Gorge. The opportunity for wildlife viewing is endless. For the active folk in our group the trip also has hiking, fishing, bicycling, horse riding and canoeing options – and for those who’ve always wondered what sharing 9 holes with kangaroos might be like, we can arrange a game of golf at a local golf course. It’s definitely a unique itinerary with flexibility and room for spontaneous and unexpected encounters. Arrive in Melbourne, met on arrival and transferred to overnight hotel. Your flight will most likely arrive in the morning. You’ll have time to relax after your arrival before we officially meet at 4:45pm in the hotel foyer. Here you’ll meet your guides and the other guests. From the hotel we’ll board a famous fleet of historical trams that have become the Colonial Tramcar Restaurant – the first travelling Tramcar Restaurants in the world. This is a delightful and innovative approach to dining as we cruise the city streets of Melbourne, enjoying an Australian seasonal menu and quality Australian wines. Energy dependent we may visit a local ‘Aussie Pub’ before retiring for the night. Note: If you have the time we strongly recommend arriving in Melbourne on December 1 so you can recover from a long flight and be relaxed and ready for the Melbourne walking tour. Overnight lodging on December 1 is not included but can be arranged on your behalf. Additional walking tour option: After a long flight you may be looking to stretch your legs. For those inclined we’ll meet at 12:30PM for a walking tour of downtown Melbourne with a local guide. The tour will touch on Melbourne’s Laneways, Victoria’s Gold Rush, the Old Melbourne Gaol (jail), Indigenous History, the Yarra River, Federation Square, Outlaw Ned Kelly, Eureka Tower and Chinatown. Approximate tour duration 2 hours. We leave Melbourne this morning after breakfast, headed east through outlying suburbs, then farming areas and finally bush landscape. We’ll stop in the tiny town of Rosedale for lunch at a quaint café to sample some famous Australian savory pies and a unique selection of sweets. We’ll continue on to The Waterfront Retreat at Wattle Point, our destination for the next two nights. Our accommodations are located on the edge of Lake Victoria with waterfront and bush views. The area is surrounded by a natural reserve of Banksia, Eucalypt and Wattle, and is home to friendly kangaroos who’ll visit right outside your door. There are also many birds including rosellas, rainbow lorikeets, galahs, cockatoos and honeyeaters, a variety of possum, wombat (a large but harmless rodent the size of a keg of beer), and a resident Echidna (spiny ant eater). Take a bicycle ride, paddle a canoe or kayak on the lake, or walk around the grounds before we depart later in the afternoon for a boat ride to Ninety Mile Beach, one of the longest, unspoiled un-interrupted beaches in the world (not to mention a marine reserve). 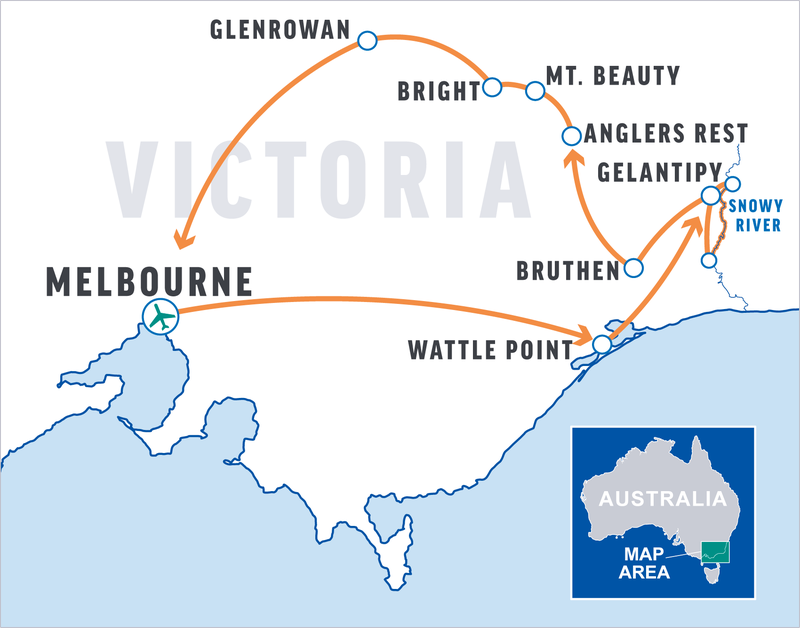 Ninety Mile separates the Gippsland Lakes (the largest inland water system in the Southern Hemisphere, and your front yard at Wattle Point) from Bass Strait. Take a stroll along the beach or try your hand at beach fishing while we prepare a welcome barbeque. This morning we’ll visit the Krowathunkooloong Keeping Place to learn about the life of the Gunaikurnai Aboriginal people. This well-presented museum documents the history of the people before and after white settlement with historical records, and information on the impact of the Gippsland missions and prohibition of cultural practices. The display includes traditional hunting and fighting weapons, bark canoes, baskets, fishing spears, boomerangs and an exhibition of contemporary Gunaikurnai art. After visiting Krowathunkooloong we head to the waterside village of Metung for lunch. We then board a motor yacht for a cruise on the Gippsland Lakes system passing various islands, and keeping a lookout for the unique semi-fresh water dolphins who frequent the area. The cruise will finish at Raymond Island where we’ll walk through a small village and see koalas whose natural habitat is the gum trees in people’s front yards. Dinner tonight will be at a local ‘pub’ or we may return to our accommodations at Wattle Point for a delicious seafood buffet. After breakfast we’ll head north east to Buchan Caves, formed when ancient rivers carved a huge cave system from limestone rock. A local guide will lead our exploration through narrow passages that open up into caverns full of spectacular stalactites, stalagmites and other formations. Time and group interest permitting we can also take a scenic bushwalk in the Caves Reserve to see a variety of birds and native animals. After the caves tour we’ll have lunch at the Buchan pub before we drive to Gelantipy and Karoonda Park, a cattle stud and camp owned by the Sykes family. Take a stroll around our lodging as you’re very likely to see wild koalas (on the ground as well as in trees) – a very unusual occurrence for Australians and tourists alike. If there is time this afternoon our host Paul may offer a tour of the property with insight into why they raise Herford bulls (famous throughout Australia) and combine it with facilities for groups to enjoy rafting and other wilderness adventures. Before dinner we’ll pack our gear in preparation for the rafting trip. Anything we don’t need on the river will stay in our rooms at Karoonda Park while we are rafting. After breakfast we’ll head to the launch site for our adventure down the Snowy River through Snowy River National Park. There are two sections for rafting on the Snowy River – the upper and lower – both are beautiful. Which section we raft will be completely dependent on the weather, river level and access to the launch and take-out sites. The access points are critical involving 4WD tracks that can become impassible if the area receives unexpected rain. The upper section is mostly class II whitewater with a couple of class III rapids while the lower section has class III. The Snowy is an extremely remote mountain river which has earned the reputation of being a “Classic”. Rafting has not been possible for many years since a Hydro-electric scheme was built between 1949 and 1974 – still recognized as a civil engineering wonder of the modern world, but left no water for the Snowy. After recent successful environmental battles, water releases have been increased to allow rafting through the incredibly beautiful gorge and river system. Just reaching the put-in is an adventure. The last part of the shuttle is on rough dirt road to the faraway, huge and unlikely historic wooden McKillop’s Bridge. The rest of today we’ll run mostly flat water with some class 2-3 rapids, surrounded by spectacularly deep Australian mountain bushland. Water temperatures are dependent on flow, but are typically not too cold and very swimmable (there are no crocodiles in this area just in case the thought crossed your mind). Lots of opportunity to watch for wildlife and birdlife, water dragons and goannas (lizards) and the shy platypus. You’ll also find plenty of unusual plants which we’ll help identify. We continue rafting, camping tonight at another pristine beach with deep swimming and fishing holes which give you the opportunity to soak in what will probably be one of the few times in your life you’ve felt extremely remote from the rest of humanity, whilst immersed in a captivatingly exotic world. Downriver the occasional glimpse of the fringes of farmland do not take away from this feeling, as it’s pretty clearly the end of the line, even for the farmers! If you’ve been to Katmandu, London or even Peru, although they’re wonderful places to visit, you never really get that longed-for feeling of being one of the only ones that ever arrived there. Here, you will in spades! At the take out (which will depend on water level and access to the river which is also weather dependent) we’ll load up and return to Gelantipy and Karoonda Park. We’ll stay at the Lodge House again as the perfect end to our rafting adventure. We’re sure everyone will welcome a real shower and toilet after a couple of nights of camping out. After breakfast we’ll head back through Buchan and then north through the tiny towns of Bruthen, Ensay and Swifts Creek before arriving in Tambo Valley. We’ll stop for lunch at the Pressing Shed and Nullamunjie Olive Groves. Here we meet our hostess Annie, who started planting olives to support her father’s sheep and cattle grazing. Now the award winning Nullamunjie is a true single estate olive oil – grown, pressed and bottled on sitesprang up after gold was discovered in 1851. Pioneering “High Country Cattlemen” and Chinese miners have all left their mark across the region. Once totaling a few thousand inhabitants, Omeo now boasts a population of some 300 people and a strong historical society who lovingly maintain a small historical park and ‘downtown’ made up of five heritage listed buildings. We’ll also visit Terry Petersen’s gallery (a talented artist inspired by the wondrous and unique landscape) and his private museum where mountain art and history combine. We continue to our home turf: Anglers Rest which is a winding 30 minute drive through beautiful mountain country with views of the Mitta Mitta River. Anglers Rest will be our base for the next 3 nights and 2 full days. It is not a town as such, but an area where 3 rivers converge: The Mitta Mitta, the Cobungra and the Bundara. Area population: possibly 20 if everyone is home at once! The Blue Duck Inn is the ‘hub’ of Anglers Rest, situated on the banks of the Cobungra River (the name comes from a gold mining lease that produced no gold). It also happens to be the only commercial establishment within 30 miles and services the area with cabins, meals and liquid refreshments. It is the meeting place for emergencies and celebrations alike. Here we’ll meet more local folk and explore the area with various activities available. Hiking – there are many trails available ranging from 20 minutes to multiple hours. Some are easy to navigate on your own, mostly they will be guided walks. Four wheel drive to visit one of the few remaining historic cattlemen’s huts – the High Country Cattleman is iconic for his horsemanship, bushcraft skills and resourcefulness. A number of huts were built throughout the high country by the cattlemen for storage and to shelter while driving their cattle from one mountain area to another. Most were lost in the ’03 bushfires. Off the grid tour to see our locally built home with micro-hydro and solar power, composting toilets, grey water system and solar/woodstove hot water supply. Wombat watch – join one of your guides for an evening venture to find wombats on the hunt for their dinner (roots and grass). Dinner one night will be at a local’s home with a presentation about the history of fire in Australia and how the local people prepare and deal with the annual threat of massive bushfires. Another night will be at Payne’s Hut to meet Tess and Graham who have pioneered their own incredible piece of mountain land into a sanctuary of lush plants and gourmet food. After breakfast we leave Anglers Rest and head up into what is truly known as the ‘high country’ of Australia (the highest peak in the land “Down Under” is Mt. Kosciusko at 7,000 feet). This is also the Alpine National Park, Victoria’s largest National Park covering 646,000 hectares (2.5 million acres) supporting over 1100 native plant species of which 12 are endemic to the park and 38 of national significance. The high country is steeped in history from the Aboriginal Traditional Owners of Victoria (the Bidawai, Dhudhuroa, Gunaikurnai, Jaithmathang, Taungurong and Nindi-Ngudjam Ngarigu Monero tribes), the miners of the 1850’s gold rush and the high country cattlemen. Closed from May through October, this is the best road to see the vast and rugged views. Here we cross Australia’s Great Alpine Walking Track which stretches through 2 states. Take a stroll through the magnificent snow gums (alpine eucalypts), hike to Mt Cope, and visit one of the last of the old cattlemens’s huts; the National Trust classified Wallace Hut which was built in 1889 – you might even see a wild brumby (a.k.a. mustang). After travelling through alpine meadows, we’ll head over the top of the mountains down to Mount Beauty, a small town in the impressive Kiewa River Valley. The fertile river flats and four distinct seasons make this among the most agriculturally rich areas of Australia. Here we will visit “Arby’s Place”; our driver and friend Arby’s wonderful eclectic home, to enjoy lunch. We then continue through the Kiewa to the picturesque town of Bright. Here we can stroll through the small mountain town for shopping, enjoy the walking path along the Ovens River, or enjoy a treat at the local bakery. Tonight we may get to enjoy some local music, and sample some local market cuisine including Bright’s locally brewed beer! From Mt Beauty we head through the hills and through the town of Bright, a beautiful town with amazing gardens and a small shopping area. Time permitting we’ll hike along the ‘river walk’. From there we head to Mount Buffalo National Park with its granite cliffs and rocky outcrops rising up from the Ovens River Valley below. Mt Buffalo is a nature lover’s paradise offering walking tracks, waterfalls, wildflowers, forests of snow gums, mossy plains and abundant wildlife. Here we are likely to see Peregrine Falcons and Superb Lyrebirds; the amazing mimics of the avian world distinguished by their elaborate tails. Later this afternoon we’ll head to Gapsted Winery for a tour and lunch. This is the dream child of seven great friends who are also wine professionals. Their extensive experience in the industry and their passion for the King and Alpine Valleys together with a premium brand of cool climate red and white wines are at the heart of this winery’s success. The vineyard produces award winning wines such as Pinot Gris, Prosecco, Fiano and other unusual varieties. The unique combination of having winemakers and growers as owners allows them to have total control over the process from growing the fruit, right through to the making and marketing of their wine. Our destination is the historic town of Beechworth, a 20 minute drive from Gapsted where we’ll have time to explore before dinner at a local pub. Apart from the history and lovely aspect of the town, a trip to Beechworth means a visit to the popular bakery, where we suggest you have breakfast. We have not included breakfast today so that you have the option to choose from the huge variety of baked goods, many of which are unique to Australia. There is so much to choose from that Australians travel from far and wide for both savory and sweet treats. A historic walking tour is available immediately after breakfast or you may prefer to browse around the local shops before we continue on to Milawa’s Cheese Factory for lunch. Here we can learn about the delicious Australian farmhouse cheeses inspired by European methods. All the cheeses are still lovingly handmade, preservative free using non-animal rennet, made on site. From Milawa we head back to Melbourne via Glen Rowen. Glen Rowen is a quiet little hamlet originally used as a horse-coach staging point. The infamous police siege in 1880 of Australia’s notorious bushranger Ned Kelly and his gang put the town on the map. We’ll continue on to Melbourne arriving later this afternoon. Check into our hotel and meet for a farewell dinner. After breakfast you will be transferred to the airport for your outgoing flight. Please request a ‘willing to share’ if you are interested, as we often have solo travelers on our trips who are also willing to share. Consumer disclosures can be found at: https://oars.archinsurancesolutions.com/disclosuresIf you enrolled in a Trip Mate policy through OARS on or before December 9, 2018, the policy is still in place and will be administered by Trip Mate through the end date of your scheduled travel with OARS. All information provided in regards to the Trip Mate policy remains relevant. For a complete description of your Trip Mate policy, go online to: http://www.tripmate.com/wpF431X or call Trip Mate at 800-888-7292 (reference Plan #F431X). has met minimum numbers prior to booking flights and/or reserving overnight lodging for the night before and after your trip, if applicable. minute Whitewater Orientation video before joining us. Watch at https://www.oars.com/experience/safety/ or call 800-346-6277 to request a free DVD. Please don’t leave home without watching. ☐ Payments: A deposit of $1000 per person is required to confirm your space. A second deposit of $1000 is due June 2. Final payment is due September 3. Please let us know if you would like us to automatically charge your credit card on file when the second and final payment is due. Documents and final payments are due no later than 90 days prior to the trip departure (September 3). You should plan to arrive in Melbourne by late morning on December 2 (most flights will depart the west coast of the U.S. on the evening of November 30 crossing the international dateline, arriving Melbourne on the morning of December 2). After claiming your luggage, you will be met by an OARS representative and transferred to your hotel which is located in the downtown area and is within easy walking distance of an abundance of cafes, restaurants and shops. If you arrive in Melbourne after 11:00AM on December 2 you will need to take the Skybus shuttle from the Melbourne airport to the Southern Cross train station. The hotel is across the road and around the corner. OARS will reimburse you for the Skybus transfer if you arrive later than 11:00AM on December 2. We’ll meet in the hotel lobby at 12:30PM for the walking tour or 4:45PM for our tram tour and dinner. If you aren’t tired from your international flight, we’d love you to join us at 12:30PM for the walking tour of downtown Melbourne. Note: If you have the time we really recommend arriving in Melbourne on December 1 to take advantage of the walking tour of Melbourne on December 2. If you arrive in Melbourne at 10:00AM or later on December 2 it is unlikely you will be able to join the walking tour due to clearing immigration, collecting baggage and the distance from the Melbourne Airport to our hotel. United, Cathay Pacific, Virgin Australia and Air New Zealand all offer flights to Australia, along with Australia’s flagship carrier, Qantas. There are also other airlines such as Japan Airlines, China Air and Singapore Airlines that have flights into Melbourne. You will find most flights depart the U.S. on the evening of November 30, crossing the international dateline before arriving in Melbourne on the morning of December 2. Please let Carrie or Emily know if you need assistance with flight arrangements. Once you or your travel agent have made your airline reservations, please send us a copy of your air itinerary at least 90 days before departure. We need this information so that we can arrange to meet you at the airport and also transfer you back to the airport at the end of the trip. Your trip finishes in Melbourne on the evening of December 14 where we have a farewell dinner planned. A transfer from your hotel to the Melbourne airport on December 15 is included (flights departing from Melbourne the morning of December 15 will arrive on the west coast U.S.A. on the morning/same day of December 15). The Tourist Refund Scheme (TRS) allows you to claim a refund of the goods and services tax (GST) and wine equalisation tax (WET) that you pay on certain goods purchased in Australia. The Tourist Refund Scheme office is operated by the Australian Customs and Border Protection Service and is located on the Departures Level just after Customs within the main MEL Airport Tax & Duty Free store. TRS is open to all overseas visitors and Australian residents, except for operating air crew. Claims are only available up to 30 minutes prior to the scheduled departure of your flight. To make sure you have enough time to make your TRS claim, you should complete your departure immigration clearance at least 90 minutes before the scheduled departure time of your flight. The airport departure tax in Australia is $38 per person; however the tax is usually included in the price of airline tickets and is not collected at the airport. Check your airline ticket to ensure the departure tax has already been prepaid. Airport taxes are subject to change without notice. If you don’t have a passport, apply for one immediately because the process can be lengthy. If you do have a passport, find it and check the expiration date to see that it is valid for at least 6 months from your planned entry into Australia. Also check your passport for blank pages. If you do not have at least two blank pages in your passport, we recommend that you apply to have extra pages added. Do not pack your passport in your checked luggage. You will need it for immigration and customs officials. If you are a US or Canadian citizen, you need to obtain a visa prior to your arrival in Australia. Visas cannot be obtained upon arrival at the airport. For more detailed information visit the Australian Government Department of Immigration and Citizenship website. Full details for Visa requirements, an online application and complete instructions can be found at: https://www.eta.immi.gov.au/ETAS3. Citizens of countries other than the US and Canada should check with the consulate of Australia for entry requirements. We suggest you make copies of the photo page of your passport and of your Australian visa and carry them separately from your passport in case they are lost or stolen. Spare passport photos will also expedite this process. It is also a good idea to leave a copy of your passport and Australian visa with your emergency contact at home. If your documents are lost or stolen, a photocopy will help the local US consulate speed up authorization for replacement. may require stepping into the boat, and then maneuvering your body over and across tubes and fixed objects into a seated position. uphill from the boats to your camping location and back the next morning, independently, or with the assistance of a friend or family member. (This only applies on multi-day trips). Our primary goal is for you to have an enjoyable experience. The nature of the trip is such that it involves some physical exertion and potential exposure to the elements, including heat, sun, wind and rain. We have experience accommodating people with a wide range of physical disabilities and/or health conditions. Please consult your doctor if you have medical or health conditions that could impact your ability to participate in this outdoor adventure. tolerated. Using common sense, and following both the explicit instruction and the lead of your guides can go a long way towards keeping yourself and the group safe. Some obvious things to avoid in camp and on shore (by way of example) are: walking around without shoes in camp, approaching wild animals, not paying attention to what is above or around your tent site that could harm you, not paying attention to hazards such as poison ivy and rattlesnakes, and walking near precipitous ledges. River trips, particularly those involving whitewater, are inherently risky. While the risk of a trip is part of what makes it an exciting adventure, you must be entirely respectful of the risk that such a trip poses. It is important that you are confident in your swimming ability, and your ability to stay calm in the event you become a non-voluntary swimmer. Your odds of becoming a non-voluntary swimmer change with the classification of a rapid, boat selection and environmental factors. On class IV and greater whitewater, the probability that you will become a non-voluntary swimmer is significant. A swim in whitewater is much more difficult and physically draining than swimming in flat water. Swimming in cold water can cause a gasping effect on your respiratory system. This can be overcome by focusing on your breathing and calming yourself down. Swimming in cold water will also much more quickly sap your energy and decrease muscle function than swimming in warmer water. While our guides are highly trained and will do their absolute best to rescue you, a successful rescue is greatly hampered by a swimmer who is unprepared for a swim in whitewater, who fails to actively participate in their own rescue, and who is not able to follow directions while under stress. You will receive a detailed orientation talk at the start of your river trip, but you can get a better idea of what to expect by watching a version of an orientation talk here: https://www.oars.com/experience/safety/. Due to the physical nature of this trip, we highly recommend that you engage in regular exercise for at least three months prior to departure to ensure preparedness. No gym membership required! Simple exercises like push-ups, sit-ups and squats go a long way to improving core fitness. Start with these exercises and do three sets of ten repetitions each, three to four times per week. Aerobic training is also easy to accomplish without expensive equipment. Take 30 – 40 minutes two to three times a week and go for a brisk walk, easy jog or bike ride around town. If you have access to a pool, lake or the ocean, swimming is obviously an ideal choice for aerobic exercise. It provides a full-body workout and is training that is useful in the event of an involuntary swim in a whitewater rapid. It is important to push yourself in the months leading up to your trip by increasing your strength training repetitions and the pace of your aerobic training. Check with your doctor prior to beginning any exercise program to be sure you are medically safe to participate. Starting an exercise program that is more strenuous than you are ready for may result in injury or risk exacerbating existing health conditions. Getting in shape will certainly add to your enjoyment of the trip! It’s important that you carry any necessary medications, along with a printed prescription for each one. Do not pack them in your checked baggage in case of a baggage delay or loss. Australia has a very sophisticated medical system in case of serious medical problems. The official currency in Australia is the Australian Dollar (AUD). Money can be exchanged at the airport, at Money Exchange Offices or at banks. ATMs are also widely available. Travelers’ Checks are another option, however they can sometimes be awkward to exchange and may involve additional fees. As of February 1, 2018 the exchange rate is 1 USD = 1.25 Australian. All major credit cards are widely accepted in hotels, restaurants and stores. Note: some establishments charge a service fee for credit card payments. Also your credit card company may also have a fee for international credit card charges. Guests often ask whether gratuities are appropriate, and in what amount. Australian service is often more casual than in many other countries, even in expensive restaurants and hotels. In keeping with Australia’s relaxed national character, tipping is not usually expected, and historically has not been normal practice—basic wage rates and overtime payments, in the hospitality industry, have generally been protected. There are no mandatory gratuities or built in restaurant service charges (although a 10% Goods and Services Tax (GST) will be included in the total figure on your bill for meals not included in the itinerary). Tipping in hotels and other service industries is still somewhat uncommon. In bars and for taxi service (should you need a cab outside of the itinerary arrangements), tipping is also not expected, although many people simply leave some of their coin change on the bar after picking up their drink, or tell the taxi driver to keep the change. If you feel your tour guide/s have provided a very special trip for you, a gratuity may be left with the trip leader who will have tipped drivers, local guides and hotel employees along the way as he/she thought applicable. Entirely discretionary, a suggestion of between $250-$500 is a general tipping guideline for this trip. This tour has little or no ‘retail therapy’ although there may be a couple of opportunities at local markets and small towns. We recommend shopping in Melbourne before or after the tour if you are looking for gifts or Australiana merchandise. In December, temperatures should be warm and skies usually clear. However, Victoria is known to have all 4 seasons’ weather in one day. As a general guideline, daytime temperatures range between 75°F and 90°F. And lows typically average around 70°F. We should be prepared for sun and a possibility of showers and cooler weather especially when we are in the mountains. Please review the recommended packing list. Alcohol is not included in the trip cost (except for the tram tour/dinner which includes drinks) and is available for purchase at hotel bars, restaurants and in designated liquor stores. It is not available at local supermarkets. Try some of Australia’s beers and award winning wines during your visit. The electrical current in Australia is 240/250 volts, AC 50Hz. The Australian three pin power outlet is different from that in North America so you will need an adapter socket. If your appliances are not 240/250 volts you will need a voltage converter. Universal outlets for 240V or 11 OV appliances are usually found in leading hotels (hotels will have hairdryers in the bathrooms). We request that you do not smoke in vehicles, at meals or in group situations. We have asked our guides, drivers, and staff who smoke to follow the same consideration. If a smoker and a non-smoker are sharing a hotel room, we ask that the smoker not smoke in the room. If you have someone that needs to contact you about an emergency at home, they should call our office (800-346-6277). For your family at home you should define for them what you consider an emergency and provide them with instructions to call our office in the event one occurs during your vacation. Should your family wish to reach you directly at one of the hotels and are calling from outside of Australia, they will need to dial the international sequence of: 011-61- then the number. Delete the zero if there is one in front of the number they are dialing. Internet services are available at some of our hotels and in internet cafes. We will be ‘off the beaten track’ in the majority of areas however (especially on the rafting trip) where internet services are not available. Some of these areas also will not have cell service. If you are planning on bringing your cell or smart phone, please check with your carrier regarding international service and charges. If you plan on purchasing an Australian sim card while you are here we would recommend Telstra as having the most coverage during our tour. Fax machines and telephones are available at the hotels. Keep in mind, however, that telephone calls and faxes can be very expensive. Melbourne, Australia is 11 hours ahead of GMT. Laundry service is available at some hotels however it may not be time effective to take advantage of the service due to our schedule. It is anticipated there will be a ‘do your own’ or a laundry service when we are at Anglers Rest on day 8-9. We recommend packing synthetic fabrics which are usually easier to wash and dry quickly. The hotels/lodges selected for this tour have been chosen for their location, design, availability and hospitality. There are two properties (one night each) that do not have private bathrooms. We believe you will enjoy the ambiance of the properties and their place in this unique itinerary. The Alto is a multi-award winning boutique apartment hotel and is one of the few environmentally friendly rated hotels in downtown Melbourne. This hotel brings together classic architecture of the late 19th century and a contemporary, stylish interior. There is a choice of one or two beds with private bathroom. Wi-Fi is available. The Waterfront Retreat is located right on the shores of Lake Victoria and is surrounded by natural the Australian ‘bush’. The 1 bedroom self- contained lodges are private with private bathrooms and water views. Our stay at Karoonda Park for one night is in the ‘lodge house’ which has a large kitchen, dining and living area. The bathrooms are shared (multiple showers and toilets in a ladies bathroom, and multiple showers and toilets in a men’s bathroom). Some bedrooms have a double bed and others twins. This is a true ‘family style’ accommodation. After 4 days and 3 nights on the river we will no doubt have melded into a family group. 2 nights wilderness camping with all camping equipment (tent, sleeping bag/pad) and waterproof bags included. There will be a simple, portable toilet. There are no showers at the wilderness campsites however we will supply a number of solar showers and bathing is available in the clear fresh water. As this is a very remote area with limited accommodations we will be utilizing both the Blue Duck Inn and Bundara Cabins. Both have regular flush toilets and showers however they have limited electricity (no hairdryers at these locations). It’s possible there will be no power for a period of time late at night to early morning. There is a choice of double/queen or separate beds. Both places have river views. Nestled amongst 100-year-old trees, the Bright Motor Inn backs onto the Ovens River, and within easy walking distance to restaurants, street cafes, the Bright Brewery, specialty stores and the heart of the town. The Armour Motor Inn, situated in a secluded garden setting in the heart of the historic Beechworth village, offer rooms with a choice of queen bed or twins with private bathrooms and Wi-Fi. Ground transportation on this trip will include a comfortable van, local 4WD vehicles and sightseeing water taxis. We need to know if you have any allergies or dietary restrictions that should be considered in planning the trip. Please let us know in advance on your registration form. The Happy Isles of Oceania, Paul Theroux, published in 1992. It’s always easier to travel light! Bring only what you need, and you will have less to haul around the airports and hotels. Airlines have very strict luggage size and weight restrictions so check with your airline before packing to avoid paying expensive excess baggage charges. Throughout our tour dress is informal and relaxed on most occasions. Smart casual clothes are acceptable almost universally, and you may want to pack a light sweater for evening wear and early morning hours. A set of polypropolene/capilene/smart wool (top and bottom) are recommended as we will be in the mountains where even in summer it can cool down. In general, pack comfortable, light clothing that can be used in layers to warm up or peel off according to climate conditions. Pack walking shoes, hats – a wide brim for sun protection or a baseball cap which can also fit under a helmet on the rafting trip. Remember swimwear and sunglasses. Also remember to minimize your sun exposure with long sleeved shirts and bring a good sunscreen, or buy one locally. Please note: If you buy new shoes or sandals for the trip, make sure you break them in first! River sandals or lace up shoes that can get wet for the rafting trip and beach walking. It is unlikely we will encounter any biting insects although there may be some at the beach area of Wattle Point. If you are susceptible to mosquitoes, sandflies or no-seeums, you may want to come prepared with insect repellent. Australia does have a reputation for non- biting flies which can be annoying. Some previous guests appreciated having a head net in some areas. These are readily purchased on arrival at an outdoor store or let Carrie know in advance to purchase one on your behalf. A $1000/person deposit is required at the time of reservation. A second deposit of $1000/person is due 180 days prior to departure. The balance is due 90 days prior to departure. After you’ve made your deposit, you may transfer your trip payments to a later trip on a one-time basis for a fee equal to 25% of your payments to date. A transfer made within 90 days of departure will be treated as a cancellation. OARS. International reserves the right to cancel any trip due to insufficient sign-ups (this trip requires a minimum of 6 guests). In such a case, you will be given a full refund of the tour cost, but OARS. International is not responsible for additional expenses incurred in preparation for the trip. Everyone is required to sign a standard liability release before the trip, acknowledging awareness that some risks are associated with the trip. Safety is of the utmost concern on our trips. However, due to the nature of the activities, a condition of your participation is that you will sign this form before the trip begins. Anyone who refuses to sign the form will not be allowed to participate and consistent with O.A.R.S. International, Inc. cancellation policy, there will be no refund of the trip fees at that time. O.A.R.S. International, Inc., Snowy River Expeditions and cooperating agencies act only in the capacity of agent for the participants in all matters relating to transportation and/or all other related travel services, and assume no responsibility however caused for injury, loss or damage to person or property in connection with any service, including but not limited to that resulting directly or indirectly from acts of God, detention, annoyance, delays, and expenses arising from quarantine, strikes, theft, pilferage, force majeure, failure of any means of conveyance to arrive or depart as scheduled, civil disturbances, government restrictions or regulations, and discrepancies or change in transit over which they have no control. Reasonable changes in itinerary may be made where deemed advisable for the comfort and well-being of the participants, including cancellation due to water fluctuation, insufficient bookings, and other factors. There is risk in boating and kayaking. Rafts and kayaks do capsize. You could be swept overboard. Your guide will make every attempt to assist, but you must be strong and agile enough to “self-help” without further endangering yourself or others. We reserve the right not to accept passengers weighing more than 260 pounds or with a waist/chest size more than 56 inches. We may decide, at any time, to exclude any person or group for any reason we feel is related to safety on our trips. We are experienced at accommodating people with various disabilities. Please give us an opportunity to make you feel welcome. We need to discuss requirements ahead of time. On advancement of deposit the depositor agrees to be bound by the above recited terms and conditions. Prices and itinerary are subject to change without notice. Snowy River Expeditions is a travel partner of O.A.R.S. International, Inc., and will provide services including transportation and equipment on this trip.